Rethymnon is one of the most beautiful towns, not only in Crete, but in Greece altogether. 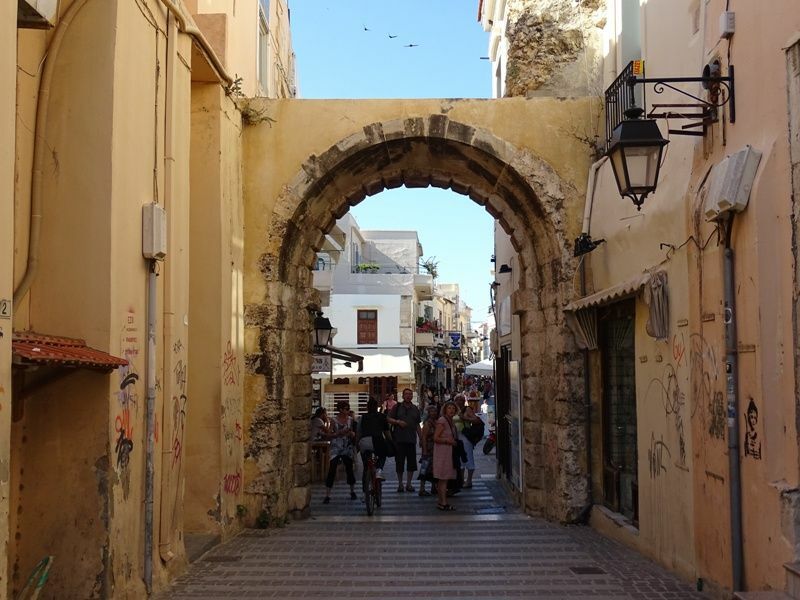 The Rethymnon old town with the colourful alleys, the venetian port, the beautiful hotels and wide range of restaurants make an ideal destination for your holidays. That is why we decided to spend the third day of our road trip to Crete there. You can read about what we did on our first day here and on our second day here. As soon as you arrive to Rethymnon old town, you can leave your car at the parking space by the port. 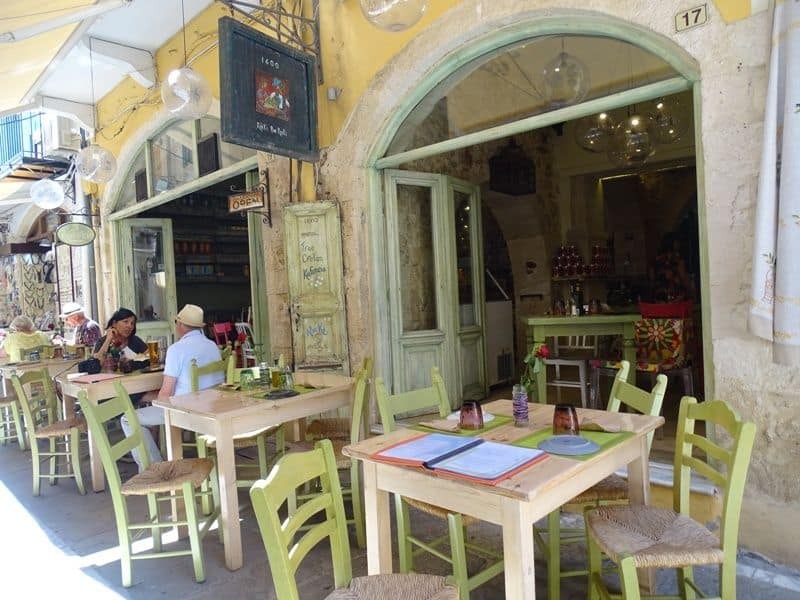 The ideal way to visit Rethymnon old town is on foot. There are numerous things you can see and do. Here is a list of my favorites. The Venetian Fortezza fortress can be found at the west side of the city, close to the new harbour. Being on the west makes it an ideal spot to watch the sunset. It was built on Paleokastro hill by the Venetians in 1573. 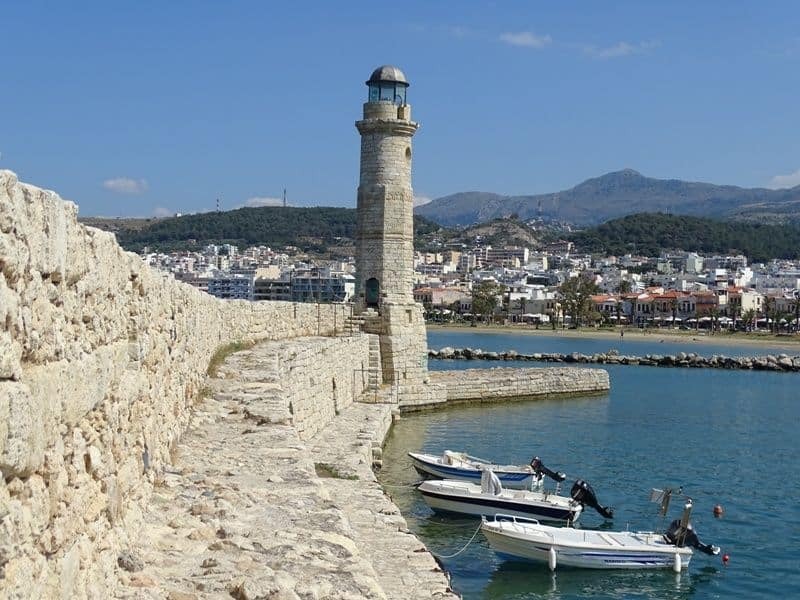 It was built to protect the city of Rethymnon from the Turks. As you enter the main gate you will see the ammunition depots, the building of the Commander and the building of the Counselor. 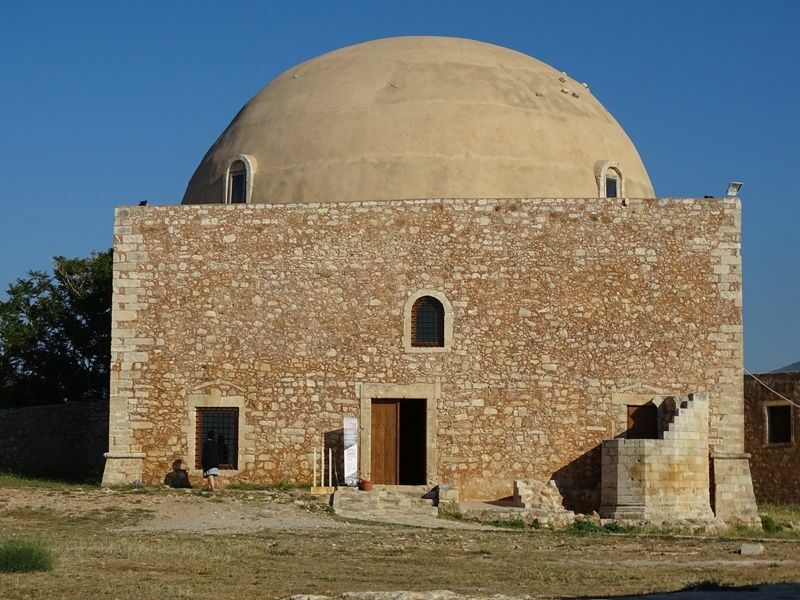 Another important site includes the old church of St Nicholas that was turned into the mosque of Sultan Ibraim Han that now hosts cultural exhibitions. Every summer the fortress hosts the Renaissance festival. Around the Venetian harbour you can find many restaurants and cafes. It is a perfect place for a romantic dinner. At the end of the mole stands the lighthouse that was built on the 17th century by the Turks. Very close to the Venetian Harbour you can find the 16th century square building of the Venetian Loggia. It used to be the place where the Venetian officials and nobility used to meet to discuss important matters. It can be found in the centre of the city at Petychaki square. 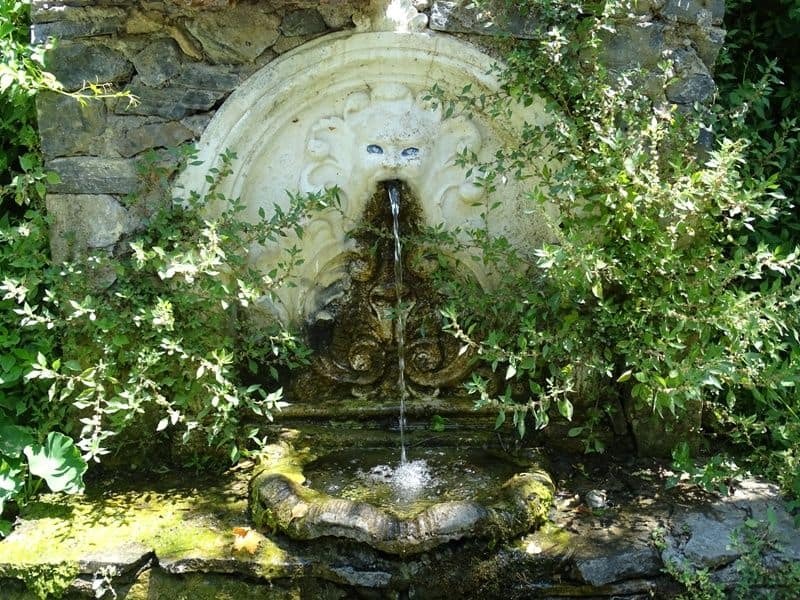 It was built-in 1626 by the Venetian governor Rimondi due to the lack of drinking water. The water runs from three lion heads into three basins. The museum is housed in a 17th century Venetian house. It exhibits objects of traditional handicraft work and folklore art. During the Venetian times it used to be the church of Santa Maria. During the Turkish occupation it was turned into a Mosque. Nowadays it used for exhibitions and concerts. 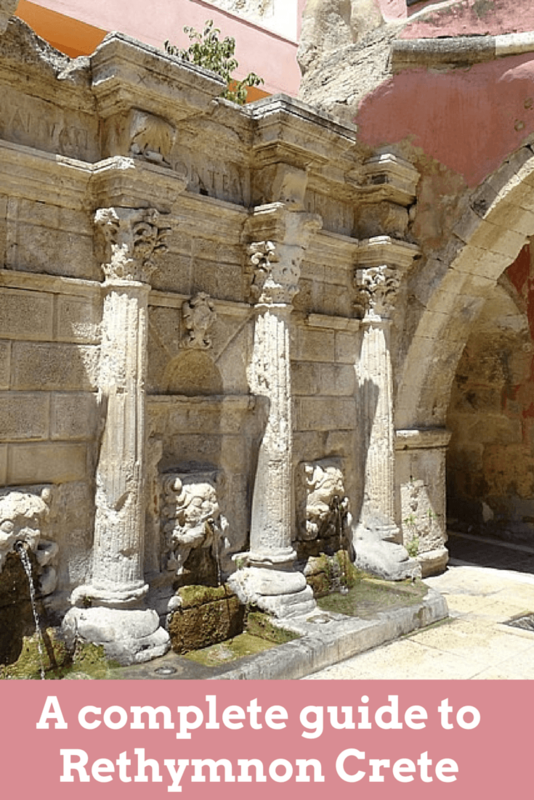 During the Venetian period it used to be the entrance to the town. Now it is the only part left from the old fortification wall. It can be found at the Four Martyrs square and leads to the main market street. One of my favorite things when I am in a new place is to wander through its streets. 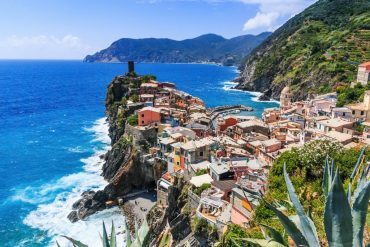 especially when that particular town was declared as a protected historical monument and a traditional settlement. 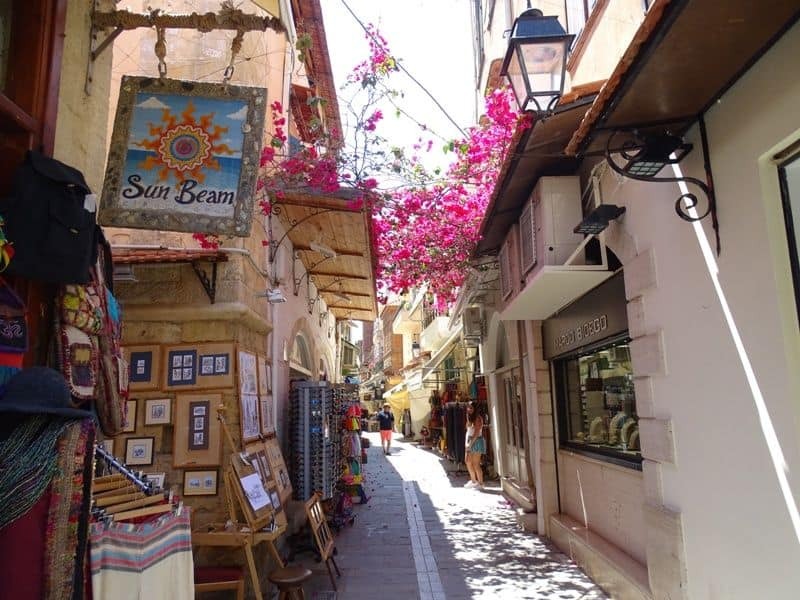 As you stroll through the alleys of the old town of Rethymnon you can see that many building have preserved the Venetian and Ottoman influence. 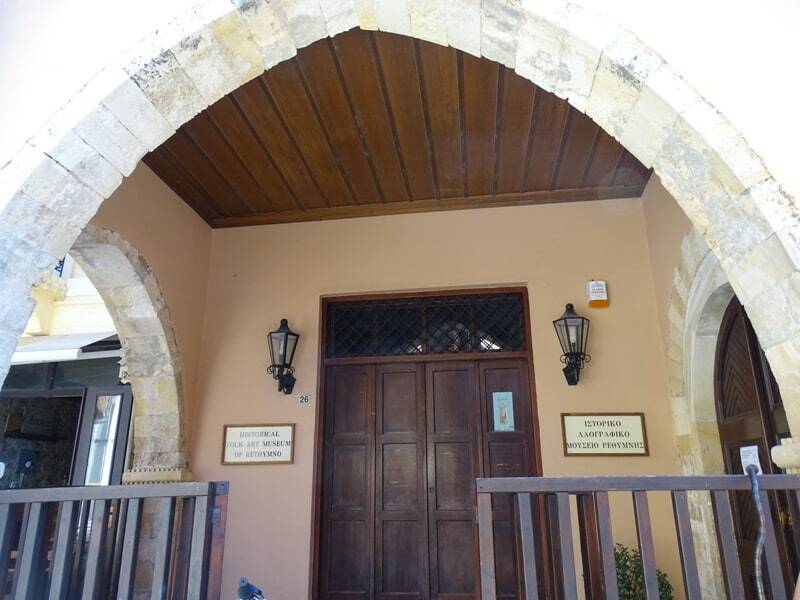 If you are staying at Rethymnon town there are a lot of things you can see and do in the surrounding area. We hired a car from Heraklion as soon as we arrived so that we could explore a little more. Argyroupoli village is located 21 km away from Rethymnon town. 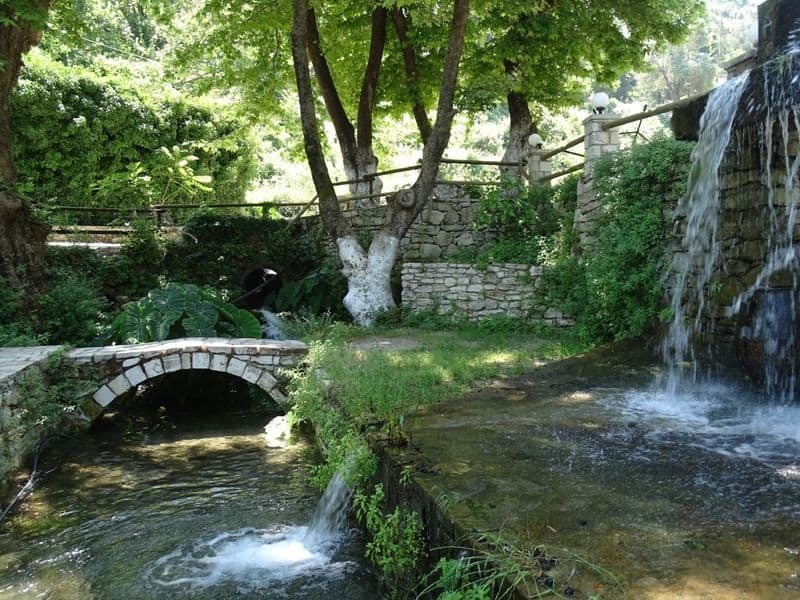 It is a traditional village very famous for its springs. 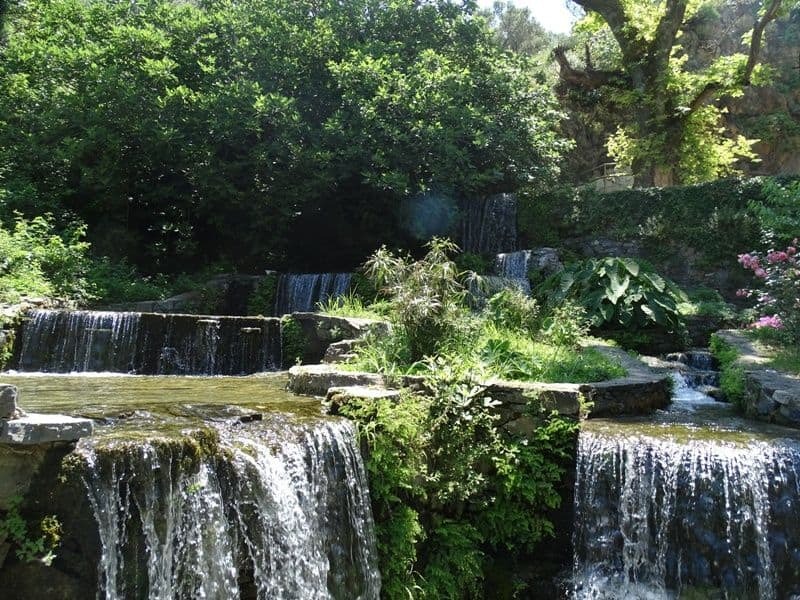 It has a vast vegetation, small waterfalls and small springs. 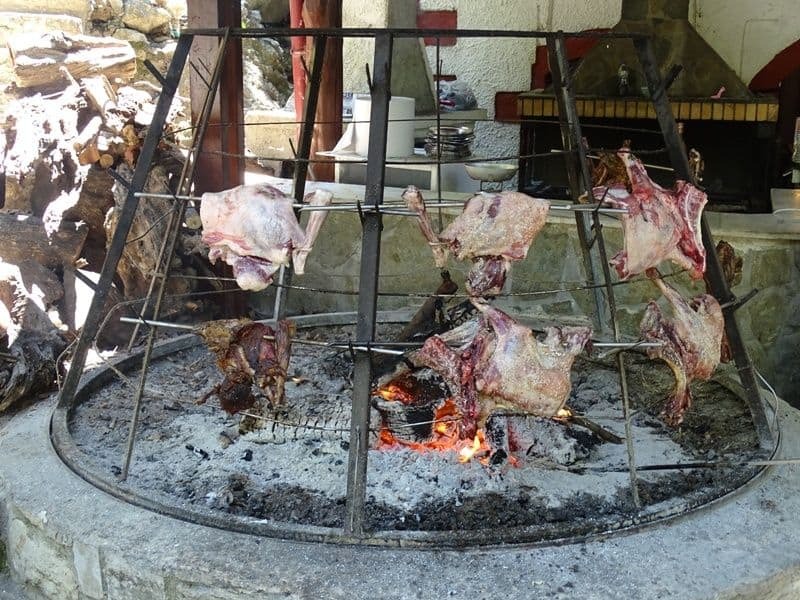 There are a lot of restaurants serving a very tasty lamb called “antikristo”. It took its name by the way it is cooked. You should definitely try it, it’s very tasty. 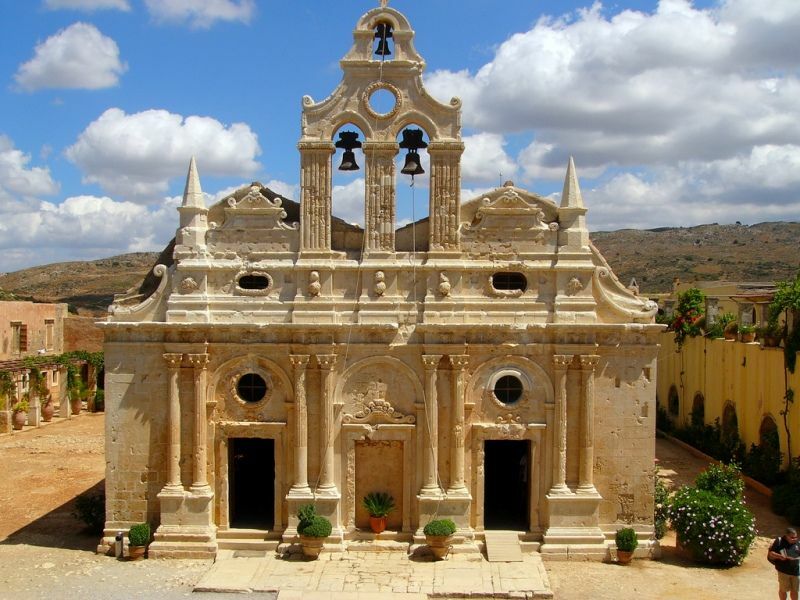 The Arcadiou Monastery is located 23 km away from the town of Rethymnon. 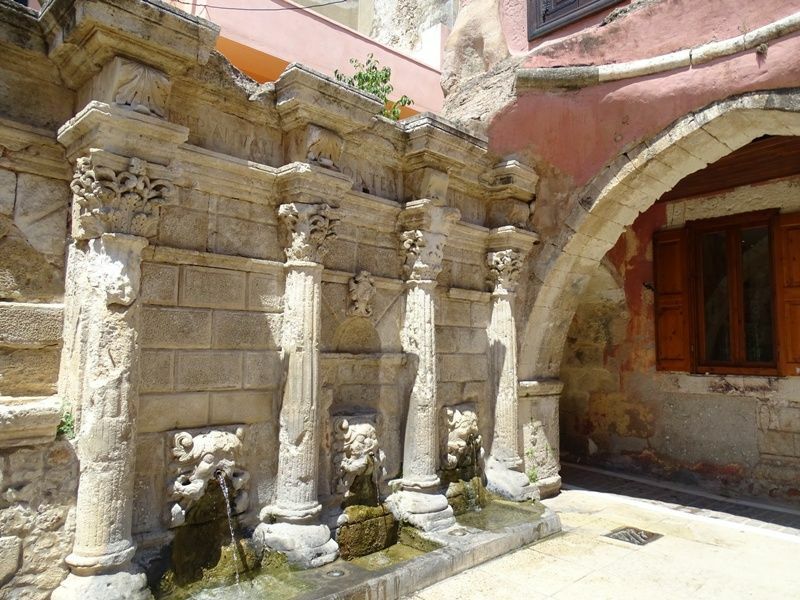 It is one of the most important historic monuments in Crete. 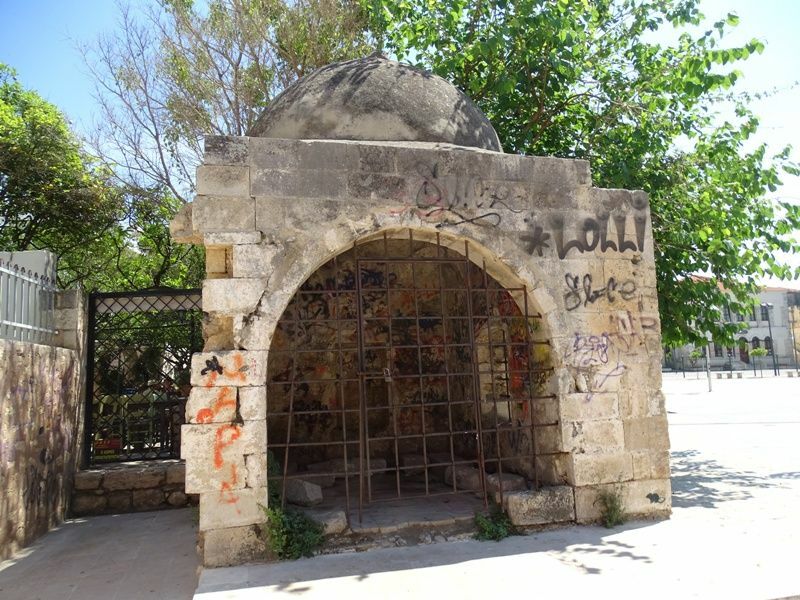 During the revolution of 1866-1869 a Cretan man called Giamboudakis decided to blast the powder keg instead of surrender when the monastery and the people hiding there were being besieged by the Turks. 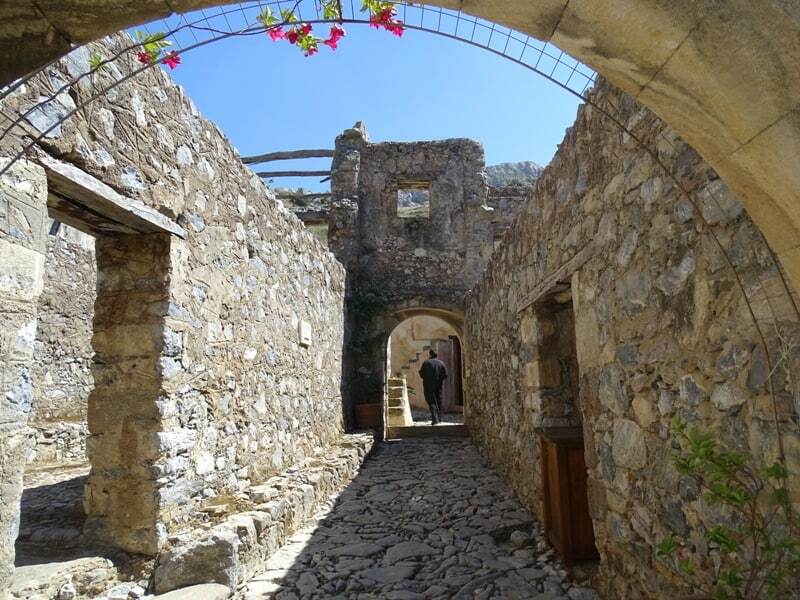 The Preveli Monastery is located 37 km away from Rethymnon. 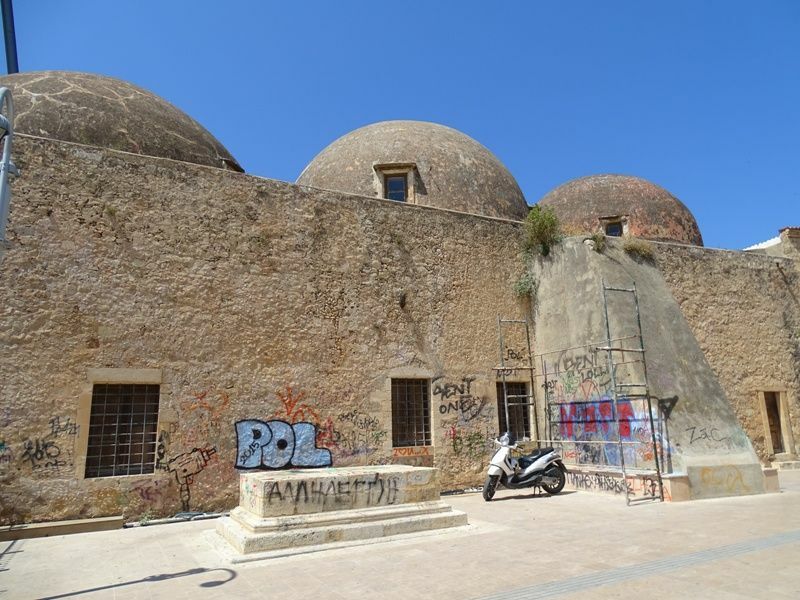 It consists of two monasteries the Lower monastery (Kato Moni) which is abandoned but can still be visited and the Rear Monastery ( Piso Moni) that is still in operation. On site there is also a museum. Very close to the Monastery is Preveli beach, one of the most beautiful beaches in South Crete with a Palm tree forest. From Rethymnon port you can do a day trip to the island of Santorini. Santorini is one of the most beautiful islands in the world. 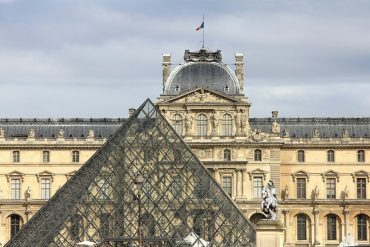 Although it is better to spend some days there, a day trip is a good idea if your time is limited. 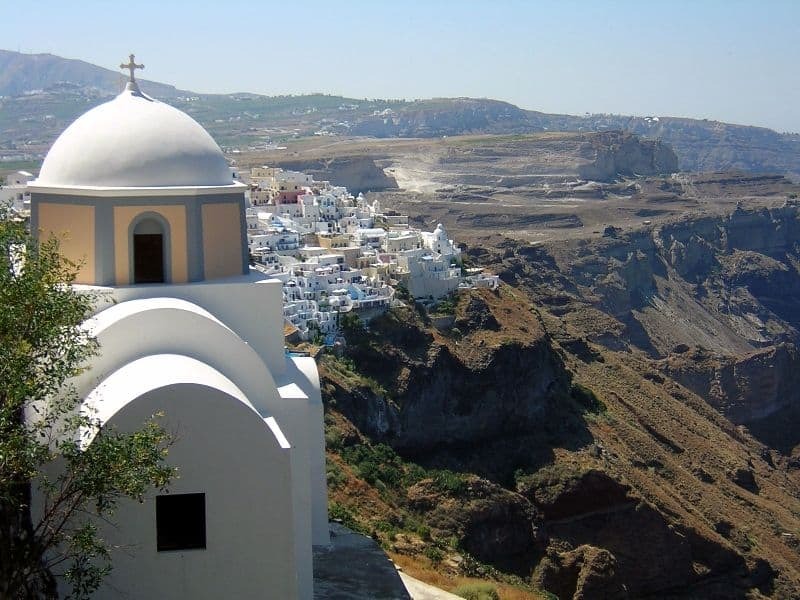 Check here for more information about a day trip to Santorini. 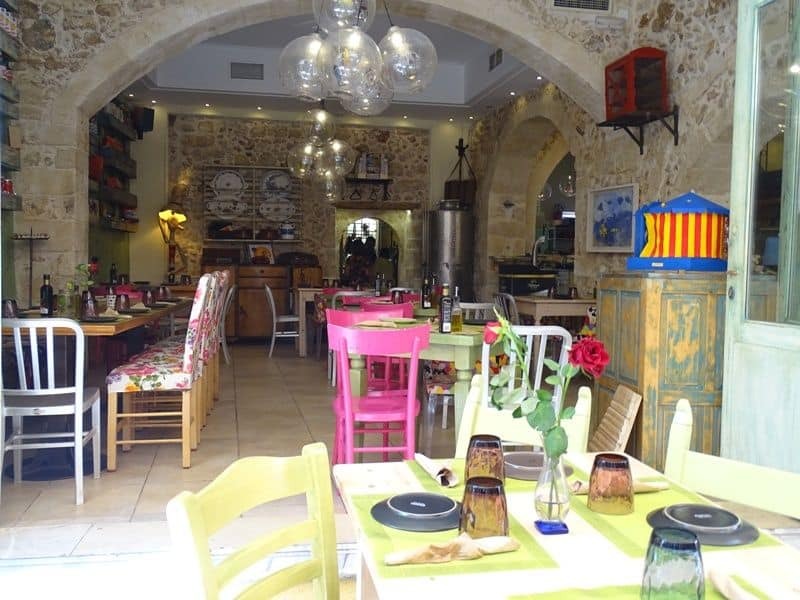 In the heart of Rethymnon’s old town is the Veneto Boutique Hotel, in a 14th century, restored Venetian building with original features and boutique furnishings that complement the historic building. The hotel is minutes from the old town shops and restaurants as well as a four-minute walk from the beach. 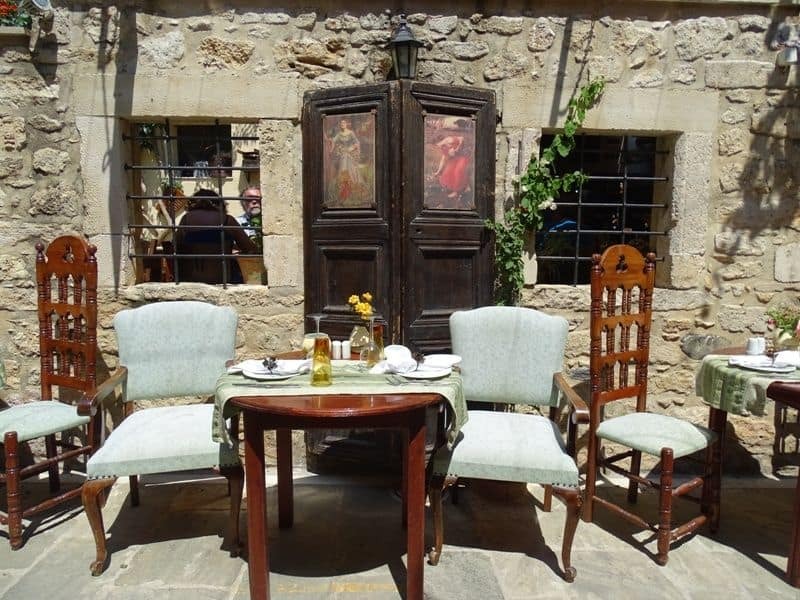 However, if guests choose to dine at the hotel, they can select wines from the expansive cellar and enjoy traditional Cretan cuisine from the local chefs. 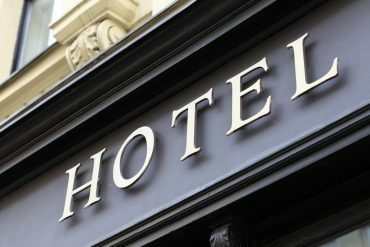 Check the latest prices and book Veneto Boutique Hotel. The nearby Rimondi Boutique Hotel is a luxurious hotel housed in two separate buildings with a large pool and courtyard in between. Suites here are equipped with air conditioning, a mini bar, free wifi, and a modern bathroom with deluxe amenities. Rimondi Boutique Hotel also has a small spa for guests. 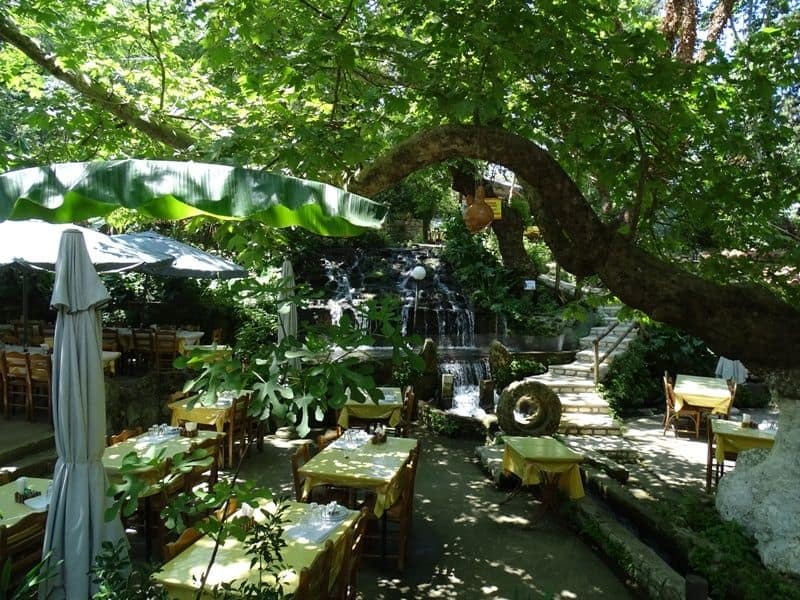 Check the latest prices and book Rimondi Boutique Hotel. The Bellagio Luxury Boutique Hotel is a small, family-run hotel in a beautiful Renaissance building in the heart of the old town. With only five suites, the hotel is a great place for couples because it is intimate yet in the middle of everything. Rooms have plush bedding, comfortable bathrobes, and small seating areas. Check the latest prices and book Bellagio Luxury Boutique Hotel. 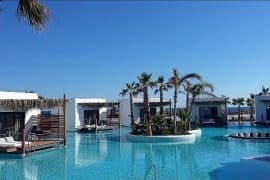 Guests in Rethymno seeking the sun might enjoy the Loggia Traditional Suites, which boasts a rooftop terrace, complete with a hot tub and sun beds. Some rooms (but not all!) also have private balconies or terraces; all suites come equipped with a private bathroom and kitchenette facilities. Check the latest prices and book Loggia Traditional Suites. 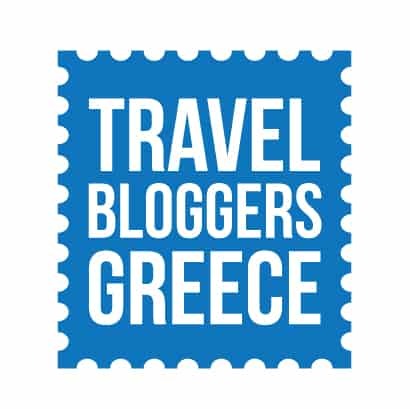 You might also be interested in: The best areas to stay in Crete. What I love about Crete is the incredible food you can eat everywhere. The ingredients used most of the time are local and very tasty. 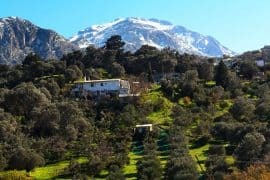 The best things to do in Crete. 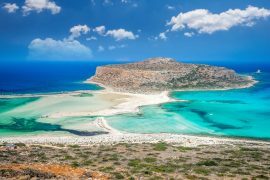 The best beaches in Crete. 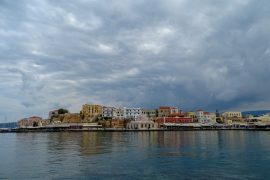 Things to do in Chania, Crete. 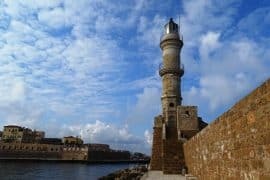 Things to do in Heraklion, Crete. 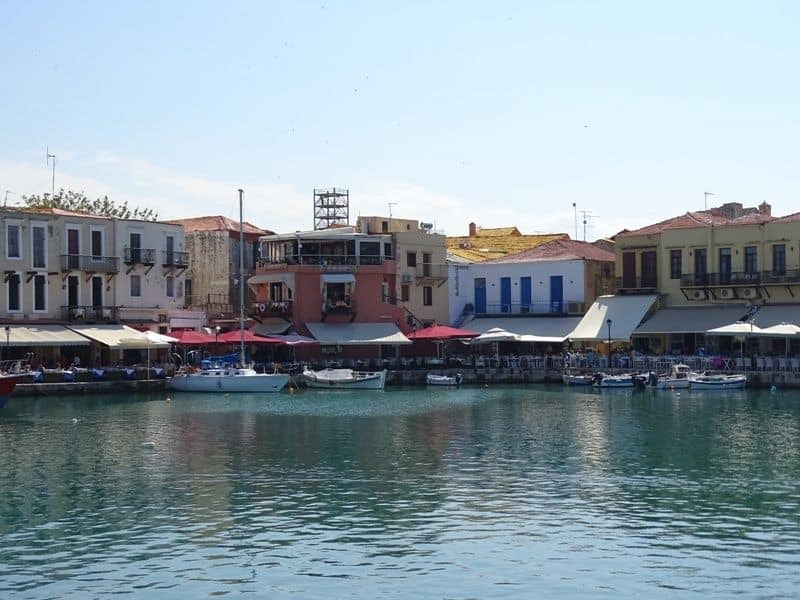 Have you ever been to Rethymnon in Crete? What did you like the most? 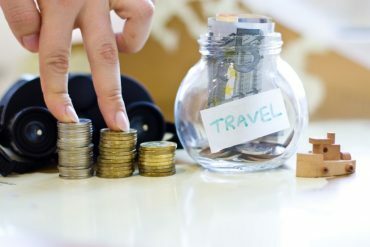 Tip: Never travel to Greece without a travel insurance. Get a free quote today. Next articleBath, England things to do. I would love to go to Crete but I had never heard of Rethymnon before. I am glad that I read your post – I have a lot of information now on what I would love to do if I happen to go! I am sure you are going to enjoy your time here! An island right out of a dream! I am seriously dreading Greece’s referendum this Sunday. The people have been squeezed so much that I fear they’ll think of the short term and bow to the political terrorism of Varoufakis and Tspiras. It is true an island out of a dream, Things are pretty difficult for people in Greece these days. I hope for the best! This is actually the first that I have heard of Rethmnon so I’m glad you introduced it to us! 😀 Will definitely be putting this up on my travel list. It looks amazing! 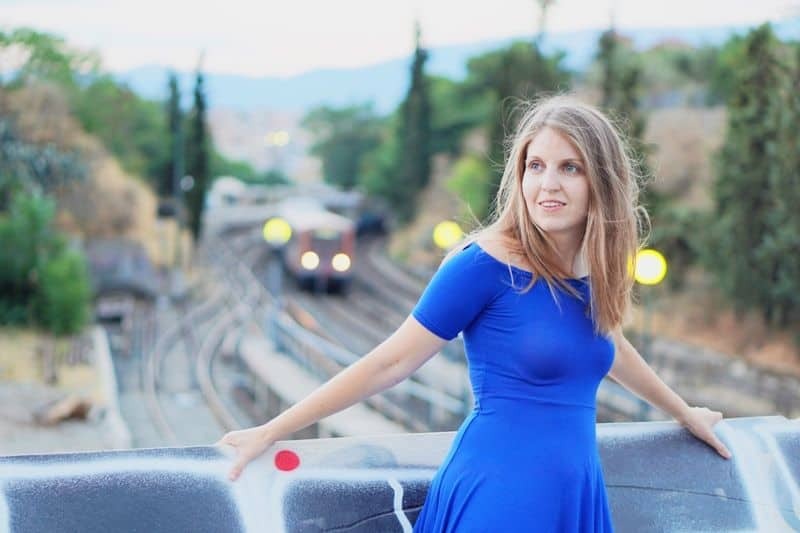 You should Aileen , Crete is full of beautiful places. Oh this looks so beautiful! Thanks for sharing such an informative post! Rethymno is my favourite place in the whole world. We lived in Iraklion four years (1965-1967 and 1972-1974) while stationed in the U.S. Air Force. Now that we’re retired, we’ve returned in 2014, 2016, and will return again this September. The Island of Crete is absolutely beautiful and what makes it so are the people of Crete. 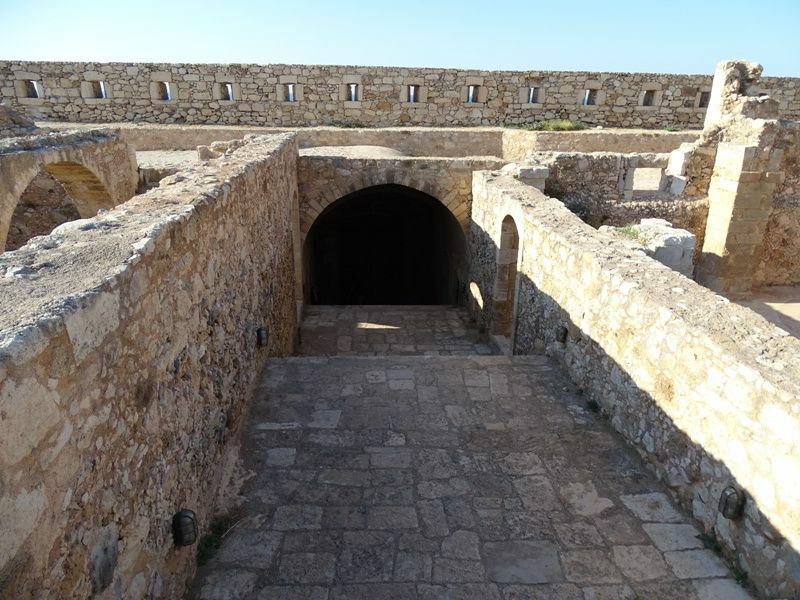 We’ve been to Rethymnon numerous times and last year spent much time at the Arcadi Monastery and the Fortress. Thank you for your suggestions! Thank you for your comment Chris. Crete is a very special place and I totally agree with what you say about people making it special. I have spent most of my summers there as a child with my grandmother. Some of my best memories. Hello, Jason. Thanks for your comment. You made a great choice! Crete and Rethymno are amazing. I am sure you will want to come back every year.